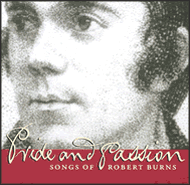 From 'Pride and Passion' (REL Records), an album of songs by Robert Burns arranged by Ron Shaw. Reproduced with permission from Tim Fitzpatrick. See the credits page for further details.